Whether you fancy getting cosy at an après ski-inspired bar, transporting yourself to Westeros at a 'Game of Thrones' exhibition, or getting boozy in the dark at an immersive blind tasting event, we've got you covered with this month's top pop-ups. Can't afford a trip to the Alps? Screw skiing and skip straight to the best part (the après-ski, duh) at this cosy pop-up bar. Piste will be decked out with vintage skis, reindeer hides and a toasty fireplace, and they'll be serving up plenty of alpine-inspired cocktails including red berry vodka with Grand Marnier and winter grenadine, and the Cable Car with vodka, sloe gin, lime, gomme syrup, mint leaves and ginger. Piste is at 3-4 Archer Street, Soho, W1D. From November 10. Setting out to prove that ping-pong paddles aren't just for playing games with, an exhibition at 71A Gallery in Shoreditch has called on artists to channel their creativity onto paddles instead of traditional canvases. The Art of Ping Pong exhibition is now in its fourth year, and the line-up of artists involved includes Matt Blease, Jon Burgerman and Jake and Dinos Chapman. And if you fancy taking some of the artwork home with you, you'll be able to bid for the paddles online, and all money raised will go towards The Alzheimer’s Society. 'The Art of Ping Pong' is on at Shoreditch’s 71A Gallery, 42 Hoxton Square, N1 6PB. November 4–8. Want a fancy fish supper without splashing too much cash? Pop-up shellfish café Lobstar is offering a whole lobster with fries, salad and dips for £25, or king prawns with fries, salad and dips for a tenner. Or if you want something a bit more carb-heavy, they've also got a crabmeat mac 'n' cheese and a veggie one, too. Plus, it's BYOB so make sure you do a quick swoop of the local off-licence before you go. Express Cafe, 15-17 Market Row, SW9 8LB. Every Thursday, Friday and Saturday night in November, 7pm–11.30pm. 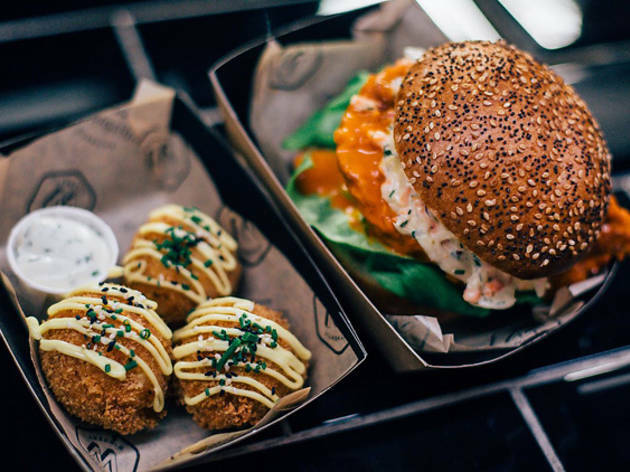 Street-food market Last Days of Shoreditch is returning for winter – and you'll be pleased to hear that it's fully heated and covered to keep out the cold. 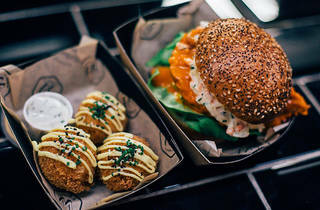 They're also offering a more civilised street food experience, with a brand new restaurant area where you can get table service from the resident traders, including Wingmans, Mama’s Jerk, Cheese Truck and Pull and Punch. 288-299 Old Street, EC1V 9DP. Suffering from 'Game of Thrones' withdrawals? Get your fix of the Westeros world at a pop-up 'Game of Thrones' art exhibition in Shoreditch, which will feature sketches from the show's creators, original storyboards and jewellery. 135 Bethnal Green Road, E2 7DG. November 10–November 13. Free. The folks at Squid Kitchen are brightening up these dark winter nights with a pop-up residency at Hackney café 119 Lower Clapton, where they'll be serving up Spanish fare including slow-cooked chorizo with paprika, piquillo peppers and sherry vinegar chickpeas, beetroot, morcilla and manchego with walnuts, apple compote and sourdough, and their signature baby squid stew with piquillo peppers and pinto beans. Delicioso! 119 Lower Clapton Road, E5 0NP. Sure, you've been drunk in a dark corner of a club, but Pitch Black offers you the chance to get pissed in total darkness at a boozy blind tasting event. Over a 90-minute session you'll be given a glass of bubbles, two cocktails, and two glasses of wine. Just try not to miss your mouth. 104-122 City Road, EC1V 2NR. Throughout November and December. Cinematic supperclub KinoVino is hosting its first food pop-up at Calvert 22 in Shoreditch. KinoVino founder Alissa will be serving up food inspired by her Jewish-Russian heritage – think latkes with smoked salmon and creme fraiche, herring paté with rye bread, and aubergine ‘caviar’ with matzah crackers. Challah! 22 Calvert Ave, Shoreditch, E2. November 19–20, 1pm–6pm.